In the last several years there has been an explosive growth of engineered materials that mimic the look of marble. Porcelain and quartz slabs are marketed to a high-end clientele as luxury surfaces in the classic Italian tradition, but with a predictable, repeatable form. So then why are the architects for luxury brands still spec'ing American marble? What we've learned, in New York at least, is that what appeals to the end user of quartz and porcelain (and even concrete), uniformity of pattern and color, is the very thing luxury brands and consumers are trying to get away from. Landscape Architect Damien Harrison, partner in Harrison Green, designs outdoor spaces in both residential and commercial spaces in New York City where he's currently working on a project for Starwood Hotels. "A lot of clients in New York like to feel they’re putting their own stamp on their space," Harrison said. "You see it all too often, these outdoor spaces in commercial sites or private residences are delivered with cookie cutter 24x 24 concrete pavers. It’s just a standard thing. The client wants to break out of that." One way Harrison and his wife and partner Jacqueline like to make that break is with natural stone, and especially American marble. "Our clients like the feel of using a natural stone. It feels a bit more elevated in the finishes. We love an opportunity to change out the ground plane as much as possible because it makes a really big impact. It’s my first suggestion and one of the first things people notice. The natural stone on the floor feels special." 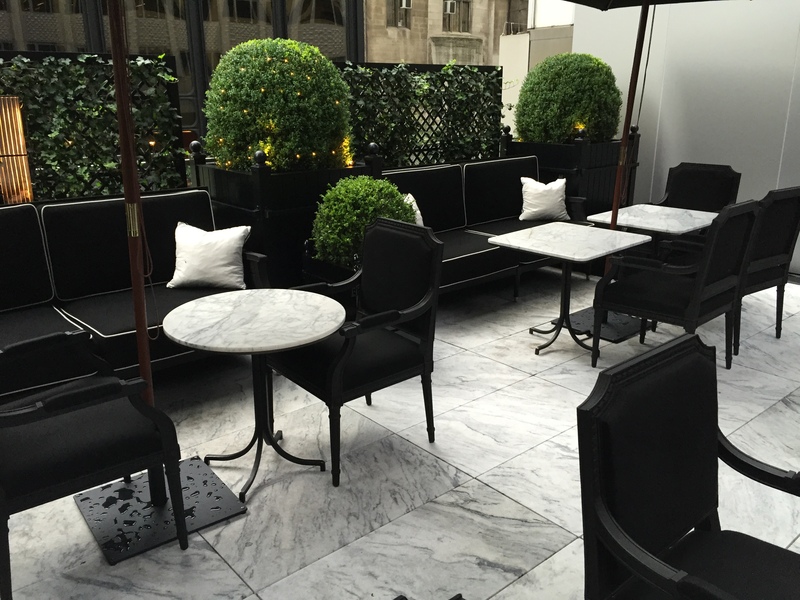 Harrison Green designed the terrace at the Baccarat Hotel in New York (pictured above) in the traditional Versailles style, black furniture and trelliage, manicured green plantings and Pearl Grey marble, a white American marble that features strong gray veining. 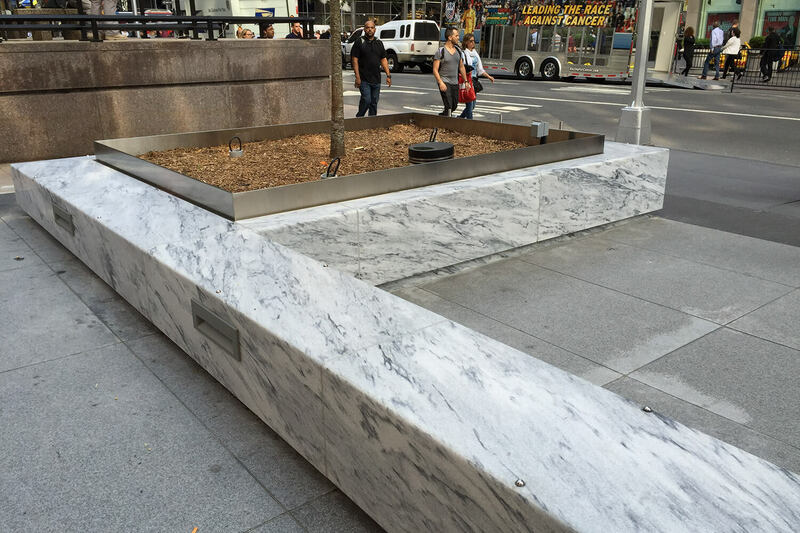 "Our first exposure to Pearl Grey marble was a residential client who said I want the stone that’s in the MoMA sculpture garden. When we researched we found it was a Polycor stone from Georgia." Sculpture Garden, Museum of Modern Art - Read more here. 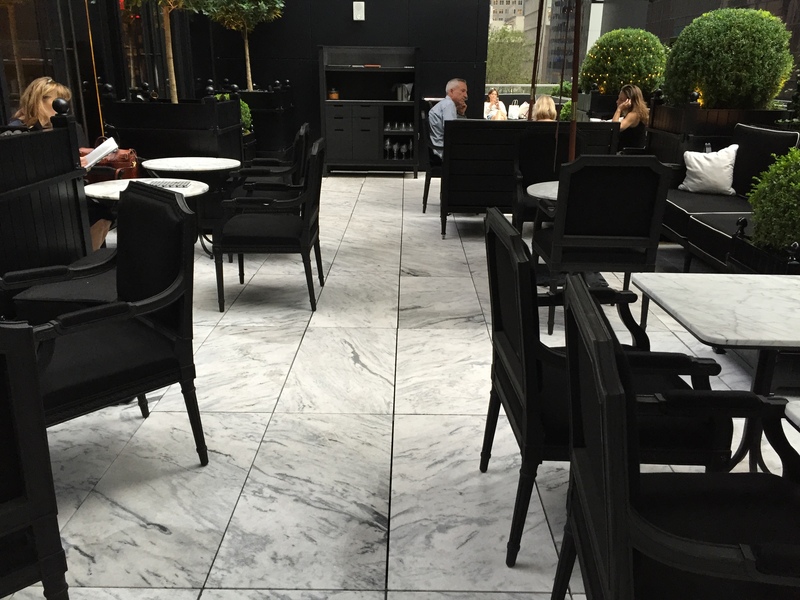 MoMA happens to be directly across the street from the Baccarat Hotel. When Harrison Green looked to create the intimate terrace there they wanted to include a sense of a link between the places and the large format marble pavers made an obvious choice for connection. "Pearl grey was so in keeping with the Baccarat brand. It has the classic elegance they’re trying to cater to," Harrison said. "The hotel is fresh and modern in its approach using traditional style elements like crystal chandeliers, in a contemporary and elegant modern sense." Harrsion ran the 12x36 pavers in a stacked arrangement rather than a running bond in keeping with the modern feel of the hotel facade designed by SOM Skidmore, Owings & Merrill. 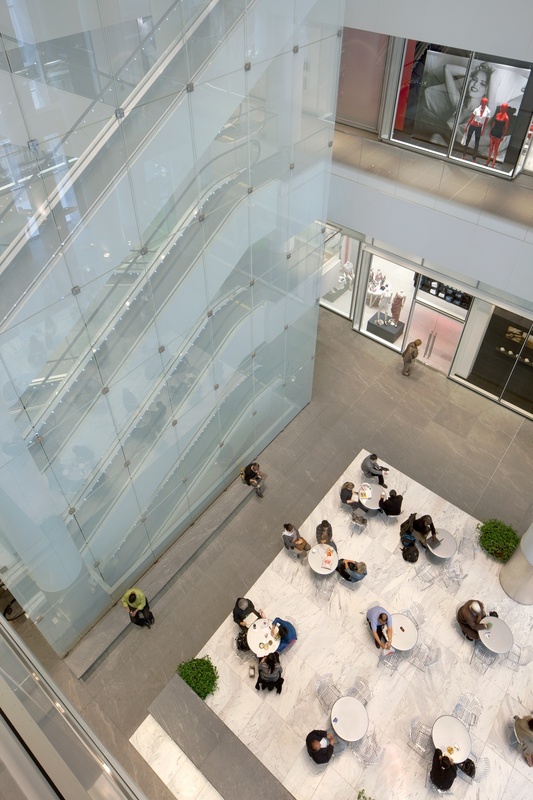 Architecutural firm MdeAS is known for their large scale commercial projects in the city like the four story atrium at the MetLife Building. The firm again and again chooses natural stone, including American marble, for it's luxury buildings because of the material's unique character. "It’s the snowflake phenomena. Mother nature never gives us two pieces of stone that are alike,” said Dan Shannon, principal architect. "You blend it in a really nice range and you’ve got a one off, custom, bespoke look that no one else has. "You can have a dozen stone projects and no two are alike." "I think that’s why stone has stayed at the forefront of premium materials," he said. "There’s no other material that’s like it." 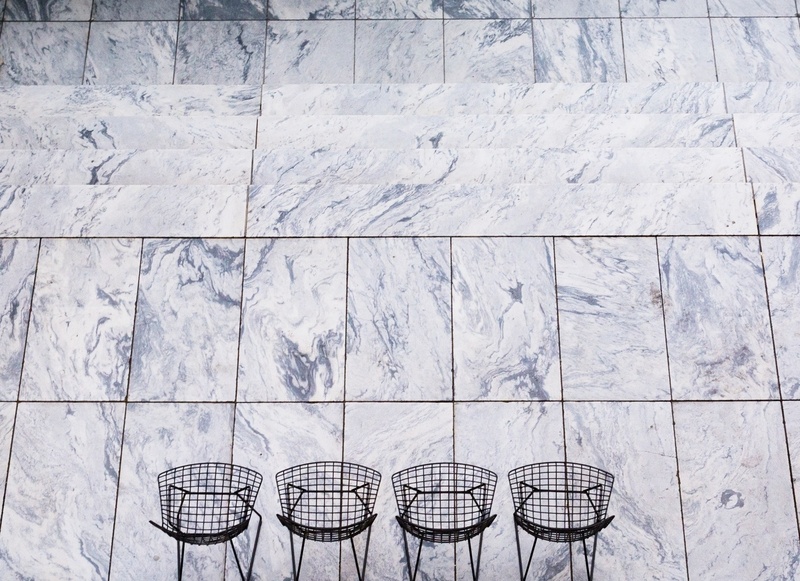 The White Cherokee American marble flooring delineates the seating area, a contrast to the gray stone used throughout the rest of the atrium. MdeAS chose the material not just for it's look but for it's durability. Georgia Marble’s tightly interlocking calcite structure makes the stone less absorbent than overseas stones like White Carrara, which has a higher absorption rate. 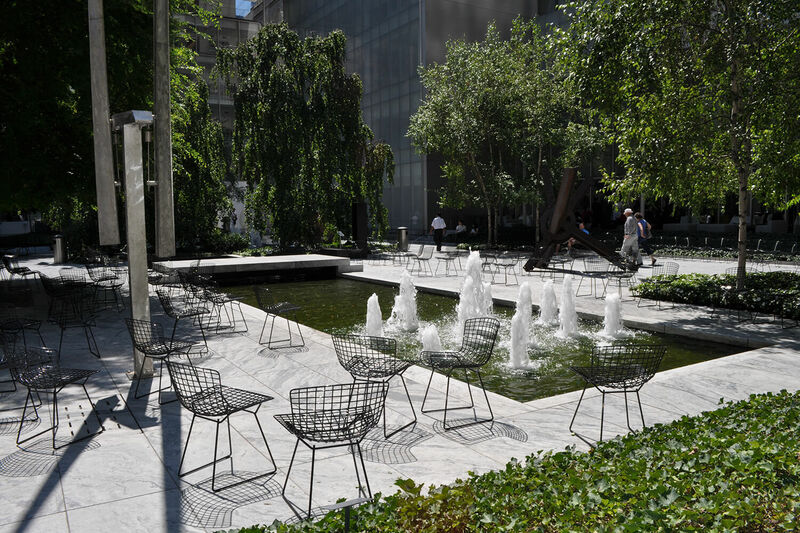 During the construction of the new Museum of Modern Art, special attention was given to the exterior sculpture garden. Designer Philip Johnson wanted a natural material that would compliment the dark exterior of the museum and artwork, brighten the space and still be durable and strong enough to support the weight of the heavy metal and stone sculptures as well as weather the elements. Urban cut to size blocks of honed Pearl Grey American marble designed by MdeAS, fabricated and installed by Miller Druck Specialty Contracting. MdeAS also renovated the building's masive atrium and side street plazas. Home to the headquarters of several major corporations, this lobby needed to foster a refined and graceful first impression. Drawing from an elegant material palette of white marble with gray veining and backlit glass accents, the lobby proudly exhibits a unique and dignified sense of space. The large format Pearl Grey American marble tiles have a more pronounced movement for a heightened effect. 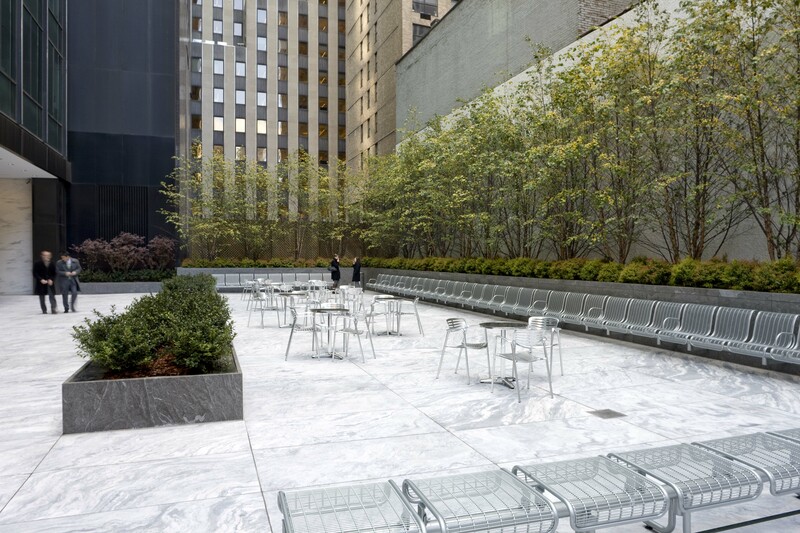 MdeAS designed the serene outdoor space of 888 Vornado as well, selecting Pearl Grey Georgia marble for the raised plaza characterized by simple geometry. The vein pattern in the stone produces a dramatic zen-like effect that draws people into the plaza for a quiet retreat. In addition to all the daily foot traffic, the plaza faces full exposure to the weathering effects of the elements and these marble pavers get piled up high with snow and ice in the winter. The honed stone is durable to handle the high traffic, direct sunlight and the effects of freezing and thawing. 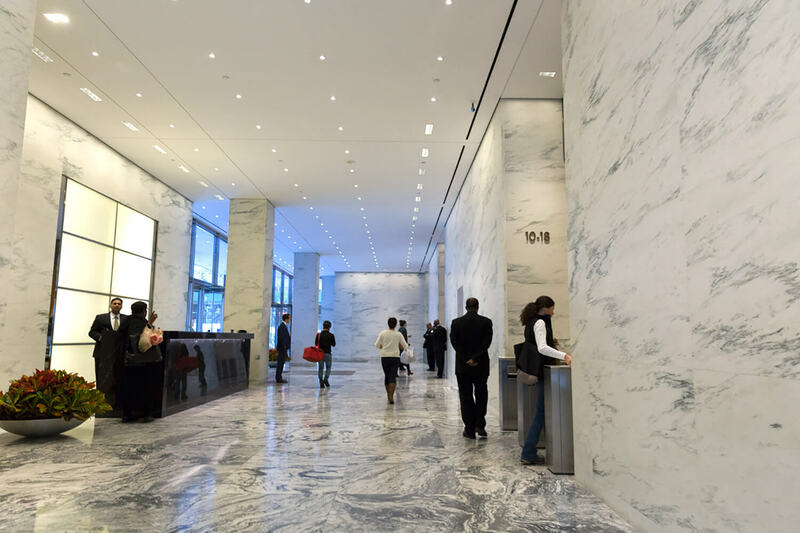 The firm selected Pearl Grey marble to serve as a visual connection to the building’s lobby which features two kinds of the natural stone including Solar Grey. Shannon said that his firm selects about 40 percent of it's marble and granite domestically. Shannon said that the North American natural stone is known for its durability. "It's the stone that built Washington, DC and a lot of New York. It's very well respected and revered." "The artistry and craftsmanship," he said, "comes from taking something that’s been hidden in earth for millions of years, cutting it, honing it, blending it and putting it in place, and it’s like no other." See how luxury brand Baccarat combined durable stone and delicate crystal for stunning retail project. Download the case study.